There are 21 Public Sector Banks which are the state-owned banks in India. Public sector banks account for 70 percent of total banking assets in India. The ‘lack of dynamism’ in banking practices at the bank level and at the Finance Ministry level to control judiciously the flow of finance and recovery system to stop an account from turning into NPA, keeps these Public Sector Banks starved of funds and crying for more capital infusion every now and then. Since the government has a majority stake in Public Sector Banks, it has to inject capital through the Recapitalization in these banks. Government of India has proposed to infuse 2.11 lakh crores in the Public Sector Banks towards recapitalization. Government proposes to issue Recapitalization bonds, raise equity from the market and make budgetary allocation. Most of the PSBs have huge stocks of non-performing loans on their balance sheets. As of June 2017, the NPAs of the banking system were as high as 10.2 % of the loans advanced by the banks. This ratio increased to 12.2% by the end of September 2017. The volume of bad debt hit 9.46 trillion rupees at the end of half of financial year 2017 in September 2017. Out of this the share of public sector banks is 8.25 trillion rupees in the pile of bad loans. The banks' deteriorating balance sheets have limited their ability to lend, and that has affected the bank credit growth in India. The bank credit growth in the year 2016-17 was 5.1 %, which is the lowest since 1951. Hence, a massive recapitalisation was deemed as necessary to clean up the balance sheet of the banks. PSBs are capital constrained as the bad loans have hit their capital ratios due to provisions for NPAs and due to higher risk weights of bad loans. An ongoing bad debt problem in India has been running since 2012 when banks expanded lending at a fast pace, including to a number of problem sectors such as telecommunications and mining. These commercial banks have to indulge in various types of loss making finances where the recovery is either very low or no recovery. Even the principal amount is not returned by the borrowers and this gives rise in consistent increase of Non-Performing Assets (NPAs). These lending could be as per the directives of Government of India, classified as priority sector lending or could be big commercial finances like that of Kingfisher. The big and influential business magnets like Vijay Mallya of Kingfisher has swallowed thousands of crores of banking system and run away. All these factors make already fund starved banking industry cry for more capital. Banks have to follow BASEL-3 norms. These are the international banking regulations that have to be followed by the banks in all countries. According to it, the banks have to maintain a capital-adequacy ratio of at least 8 %. The capital-adequacy ratio is the ratio of capital to the risk-weighted assets (loans etc) . Hence, more capital is required to be able to give more loans. The government will infuse Rs. 88,139 crore capital in Public Sector Banks (PSBs) before March 31 to boost lending and to revive growth. This is part of the Rs.2.11 lakh crore bank recapitalisation plan announced in October 2017 last year. Government also proposes to recapitalize the banks if they are ready to implement a series of reforms to get the funds, including improving their due diligence, allowing specialised monitoring for loans above Rs.250 crore, and limiting the number of lenders that can group together to dole out loans. This is not the first time that the bank recapitalisation bond will be issued in India. According to the data by Bloomberg, in the year 1994, India had sold about 48 billion rupees of 12-year recapitalisation bonds at a coupon rate of 10%. Despite using the taxpayer's money to get these public sector banks out of the financial crisis earlier also, the recapitalization of Rs.2.11 lakh crores to PSBs proposed now, is the largest till date. Since tackling the root of the banking system's problems is the government's top priority to avoid another acceleration of bad loans, the huge funding may not be avoided. The total recapitalisation will cross Rs. 1 lakh crore in the fiscal ending March 31, 2018 after including funds raised from sale of shares to external investors. The banking sector in India has Rs. 10 lakh crore worth NPAs. PSBs account for the bulk of the non-performing assets (NPAs). Ministry of Finance will raise Rs. 80,000 crore through recapitalisation bonds and provide another Rs. 8,139 crore from the Budget to recapitalise the banks. IDBI Bank has the highest stressed-loan ratio. It will get the biggest chunk of the money of Rs. 10,610 crore in Bank Recapitalization. The biggest lending bank- State Bank of India (SBI) will get Rs. 8,800 crore, and the second-biggest lender Punjab National Bank (PNB) will get Rs. 5,473 crore. Indian Bank is the only profitable publish sector bank. It is the only bank who will not get any capital in the latest Recapitalization. The government's recapitalisation programme will help to a great extent to mitigate the risks that Indian PSBs face on account of weak asset quality and poor earnings. The stock markets reacted positively to the Bank Recapitalization news. The day after the announcement on 25th Oct 2017, it was a historic day for the markets as the SENSEX closed beyond 33,000 for the first time ever. An index of Public Sector Banks surged 30 % on the day. Impact of recapitalisation could be bad on fiscal deficit of India as it may increase the fiscal deficit gap. Recapitalisation can give some breathing space to the banks for some time. But the need is to correct the rot in the banking sector. The Government should follow it up with structural reforms to reduce its role in the public sector banks and move towards privatisation. This will bring in efficiency and accountability and better NPA management. Finance Minister Arun Jaitley emphasizes on the steps to be taken to ensure governance of banks to follow highest standards. According to him there is a need for institutional mechanism to ensure the past is not repeated. "Now the entire objective of this exercise is that the government has the prime responsibility of keeping the public sector banks in good health," Jaitley said. Banks should not look for easy money like recapitalization. They need to earn and must adopt the differentiated business strategy and exit from non-core businesses and focus on their core competencies. According to the financial services secretary the government would come out with EASE (Enhanced Access & Service Excellence) Index for ranking of banks. This would increase public accountability of PSBs as independent agencies would evaluate and rank PSBs annually on reforms. It must be ensure that the proposed infusion of capital into the banks is sufficient and the banks would not become the fund starved again. 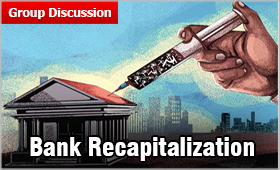 The re-capitalization no doubt will help the banks to comply with Basel 3 norms that will come into force in 2018 and may improve on their performance, it has to be ensured that the tax payers’ money is not misused and Banks do not become habitual of getting the support with another recapitalization in future. Despite the recapitalization with the thousands of crores of public money infused in it to revive the asset quality, country’s biggest lender State Bank of India (SBI) on Friday February 9, 2018 posted a standalone net loss of Rs 2,416.37 crore for quarter ended December 31, 2017 against a net profit of Rs 2,610 crore in the corresponding quarter last year. Provisions and contingencies figures increased 111 per cent year-on-year to Rs 18876.21 crore for the quarter under review against Rs 8,942.83 crore in the same period last year. Gross non-performing assets (NPAs) in absolute terms stood at Rs 1.99 lakh crore in Q3FY18 over Rs 1.86 lakh crore in Q2FY18 and Rs 1.08 lakh crore in Q3FY17. Provision coverage ratio as on December 31, 2017 stood at 65.92 per cent. Net interest income of the lender jumped 26.88 per cent year-on-year to Rs 18,687.57 crore in Q3FY18. Asset quality of SBI deteriorated during the quarter gone by as percentage of gross non-performance assets (NPA) came at 10.35 per cent in Q3FY18 against 9.83 per cent in the sequential quarter ended September 30, 2017. Percentage of net NPAs increased to 5.61 per cent vs 5.43 per cent QoQ. Shares of the the largest bank of India – SBI closed 1.68 per cent down at Rs 296.40 on Friday February 9, 2018.